If our customer have any enquirer internet speed, we will recommend Unifi high speed broadband. 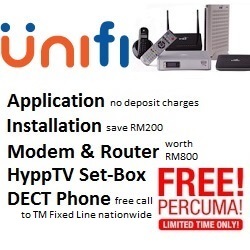 Our customer just need apply Unifi high speed broadband at unifistreamyx.info. TM High Speed Broadband (HSBB) is a broadband service that offers bandwidth delivered at network speeds of 10Mbps and above. Unlike normal broadband connections which deliver bandwidth at network speeds ranging between 384kbps and 1Mbps, basic HSBB packages will eventually allow Malaysians to experience high speed Internet of up to 100 times faster than the usual rate while businesses will be able to have maximum speeds of up to 1,000 Mbps (1Gbps). THE Government is investing RM2.7bil to further expand the high speed broadband (HSBB) network in the country. It will be implemented in the high economic impact areas, covering state capitals and selected major towns nationwide, Prime Minister Datuk Seri Najib Tun Razak said in his Budget 2015 speech. He said the amount would be spent over the next three years to build 1,000 new telecommunication towers and the laying of undersea cables. Earlier reports had said that thecables linking Peninsular Malaysia with Sarawak and Sabah would be deployed within three years to improve connectivity, reliability and affordability of Internet access in these states under the HSBB2 project. This will be the second investment to be made to provide fast Internet access to the nation by the government. With the onset of the second phase of High Speed ​​Broadband Project ( HSBB2 ) Sept 2015, TM has introduced more UNIFI coverage area nationwide . So far, the new area is covered Unifi Rawang , Dengkil , Semenyih , Teluk Intan , Kuala Terengganu , Kota Bharu , Tax , Kemasik , Langkawi , Stampin and Sandakan . With the addition of these new areas as well as the addition of new ports in existing coverage areas in the Klang Valley , Value , Sepang , Penang , Melaka , Johor Bahru , Kuantan , Sungai Petani , Kuching , Miri , Bintulu and Kota Kinabalu ; expected more households will have broadband access .